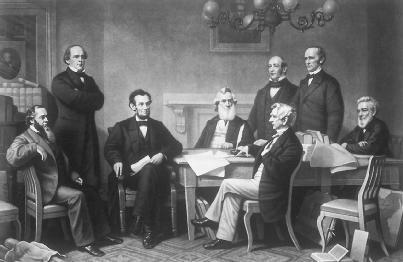 Lincoln's cabinet was nervous about the effect of issuing the proclamation, and it advised him to wait until the Union had won a major victory before releasing it. As a result, the president announced the preliminary proclamation on September 22, 1862, five days after the Union victory at the Battle of Antietam. In language that would be retained in the final version of the proclamation, this preliminary order declared that on January 1, 1863, all the slaves in the parts of the country still in rebellion "shall be … thenceforward and forever, free." It also pledged that "the executive government of the United States, including the military … will recognize and maintain the freedom" of ex-slaves. But this preliminary proclamation also contained language that was not included in the final document. For example, it recommended that slave owners who had remained loyal to the Union be compensated for the loss of their slaves. Franklin, John Hope. 1995. The Emancipation Proclamation. Davidson. ——. 1993. The Emancipation Proclamation: Milestone Documents in the National Archives. National Archives. Guelzo, Allen C. 2004. Lincoln's Emancipation Proclamation: The End of Slavery in America. New York: Simon & Schuster. Klingaman, William K. 2001. Abraham Lincoln and the Road to Emancipation, 1861–1865. New York: Viking. Levinson, Sanford. 2001. "Was the Emancipation Proclamation Constitutional? Do We/Should We Care What the Answer Was?" University of Illinois Law Review (October): 1135–58. President Abraham Lincoln supported the U.S. Civil War to preserve the Union, not to end Slavery. Though he was personally opposed to slavery, he had been elected on a platform that pledged the continuation of slavery in states where it already existed. Wartime pressures, however, drove Lincoln toward emancipation of the slaves. Military leaders argued that an enslaved labor force in the South allowed the Confederate states to place more soldiers on the front lines. By the summer of 1862, Lincoln had prepared an Emancipation Proclamation,but he did not want to issue it until Union armies had had greater success on the battlefield. He feared that otherwise the proclamation might be seen as a sign of weakness. The Union army's victory at the Battle of Antietam encouraged the president to issue a preliminary proclamation on September 22, 1862, that announced the abolition of slavery in areas occupied by the Confederacy effective January 1, 1863. The wording of the Emancipation Proclamation on that date made clear that slavery would still be tolerated in the border states and areas occupied by Union troops, so as not to jeopardize the war effort. Lincoln was uncertain that the Supreme Court would uphold the constitutionality of his action, so he lobbied Congress to adopt the Thirteenth Amendment, which totally abol ished slavery. "That on the first day of January, in the year of our Lord one thousand eight hundred and sixty-three, all persons held as slaves within any state or designated part of a state, the people whereof shall then be in rebellion against the United States, shall be then, thenceforward and forever, free; and the executive government of the United States, including the military and naval authority thereof, will recognize and maintain the freedom of such persons and will do no act or acts to repress such persons, or any of them, in any efforts they may make for their actual freedom. Source: Statutes at Large, vol. 12 (1864), pp. 1268–1269. Arkansas, Texas, Louisiana (except the parishes of St. Bernard, Plaquemines, Jefferson, St. John, St. Charles, St. James, Ascension, Assumption, Terre Bonne, Lafourche, St. Mary, St. Martin, and Orleans, including the city of New Orleans), Mississippi, Alabama, Florida, Georgia, South Carolina, North Carolina, and Virginia (except the forty-eight counties designated as West Virginia, and also the counties of Berkeley, Accomac, Northampton, Elizabeth City, York, Princess Ann, and Norfolk, including the cities of Norfolk and Portsmouth), and which excepted parts are for the present left precisely as if this proclamation were not issued. And I further declare and make known that such persons, of suitable condition will be received into the armed service of the United States to garrison forts, positions, stations, and other places and to man vessels of all sorts in said service. Highlights from the installation of two historic documents -- the Emancipation Proclamation and the 13th Amendment -- into the Smithsonian National Museum of African American History and Culture. Lincoln's greatest legacy was his work to preserve the Union and his signing of the Emancipation Proclamation, which declared all slaves should be freed. President Lincoln issued the Emancipation Proclamation after Congress enacted two statutes authorizing Union forces to confiscate and free fleeing slaves. Rael objects to my placing the Emancipation Proclamation as the real trigger of black flight. That meant slaves could be "seized'' by freeing them through the Emancipation Proclamation. In January 2013, the United States Postal Service issued a stamp commemorating the 150th Anniversary of the Emancipation Proclamation, a promise that continues to drive United States Government anti-trafficking activities. s famous "I Have a Dream" speech and the 150th anniversary of the issuance of the Emancipation Proclamation. Lincoln's hundred days; the Emancipation Proclamation and the war for the union. The theme of this year's program was "At the Crossroads of Freedom and Equality: The Emancipation Proclamation and the March on Washington. However, Lincoln was instrumental in promoting the civil and human rights of blacks and his Emancipation Proclamation was the first steps towards abolishing slavery in the US. Though it required a completion of the war itself and the eventual passage of the 13th amendment to finally put an end to slavery throughout the rest of the United States, the effects of the Emancipation Proclamation would have lasting repercussions not only in domestic affairs, but just as importantly in American foreign policy. His hands wobbly from all the hands he'd shaken, Lincoln put his unsteady signature on the Emancipation Proclamation and it was released to the world.